To be very honest, I've largely given up hope that there'll be a truly unique Star Wars novel, something that would surprise and be truly delightful. Over the past twenty-odd years, hundreds of the books have been published, and since high school, I've devoured them, and have really enjoyed the entire franchise as a whole. That being said, the books from the last couple of years have really lost their spark. I've never been sure what it was that they were missing, but whatever it was, Shadows of Mindor has it. From the beginning of the project, I've heard author Matthew Stover talk about how he wanted to make this book a bit of a homage to some of the earlier novels, such as The Adventures of Han Solo and The Adventures of Lando Calrissian. I've read both sets of trilogies, but never really got into them to the same extent that I got into the Del Rey books. Allusions to these books are fairly clear - there is quite a bit of fairly over the top action, tongue in cheek humor and a lot of similes throughout the text, not to mention a number of references to the two trilogies, but also to a number of other Star Wars books, including Shatterpoint, which Stover also penned. This book isn't a copy of the older, somewhat cheesy novels. What Stover does do, however, is shed the overall seriousness and determination that a lot of recent books have clung to, and had some fun while writing this. For the first time in a very long time, I read a book that had the characters speaking in their own voices that really pulled me back to those earlier days when I would be sneaking books during class. In short, this book brought back the nostalgia factor for me. In the universe, this is likewise a fun read because we haven't seen a whole lot of books that take place in the post-ROTJ period, at least the first year or so, and it was nice to see some of the aftermath. Unfortunately, this is one of the inherent weaknesses of the book, at least up until the last pages, because this is the type of book upon which the entire franchise could have taken a number of cues from - there is an enormous amount of characterization here that could have easily brought the entire series up a notch (the Bantam Spectra era, while fun, was all over the place as far as storylines/characters goes). Unfortunately, this book is slid into the existing storyline, and it'll basically just sit there. To some extent, Star Wars books have gotten away from some of the roots. The original trilogy of films was a homage to the old action movies and sci-fi serials, and this is evident in the text. In the years since its release, it's gotten old, and goes to bed early, and doesn't have any fun partying. Stover has kicked the franchise out of bed (or at least the lit part, for a couple hours anyway) and dragged it off to a bar for a round of drinks and at least one fight. It's a rejuvenation that I think is very needed. This book is Fun, with a capital F, and knows it. This is not to say that the Star Wars franchise is getting too old for it's own good - a majority of the books that have come out recently are quite good, but at points, daunting. There are big, epic series that have little connection to the original films and themes, and at times take themselves far too seriously. Stover has sidestepped that and gone for a vastly different direction (the reveal at the end is something that I won't reveal) that really sets this book in a class of its own. It's far too early at this stage to say whether this will become a favorite of mine, but it has resolidified Stover as one of my favorite authors that has worked with the franchise. 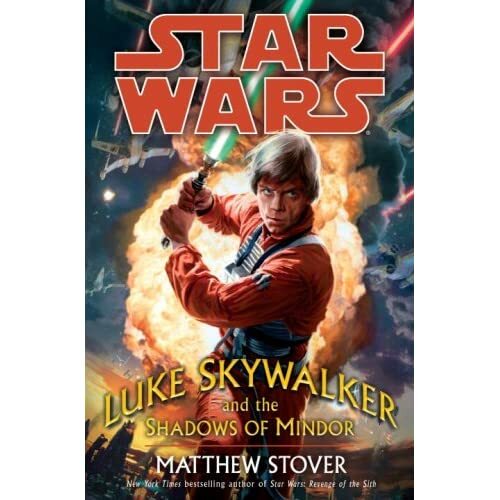 There are only a couple of authors here that have really exemplified their storytelling with the Star Wars universe, and like each of his other books, Stover has outdone himself once again. I can only hope that he'll be around to shake up things once again.